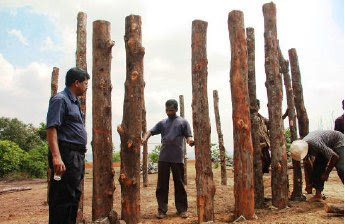 Archaeologists have discovered a pre-historic necropolis (cemetery) with megalithic cairn circles dating back 2,500 years, many 'postholes' that probably point to the ancient practice of 'excarnation,' a 'wood-henge'-like ritual monument and a site of primitive astronomical intelligence at Anakkara, near Kuttippuram in Malappuram district. Experts believe it is a promising site to study the Early Iron Age culture in Bharathapuza (River Nila) basin). Read the detailed news report in The Hindu.